Ray Colon (front row, left) and Jonathan Abrams (second from left), Managers, Gershow Recycling, present Frank Bailey (right), Chairman of the Calverton Cemetery Flag Placement Committee and Leader of Suffolk County Boy Scout Troop #433 of Middle Island, with a check for $1,000 in support of the Flag Placement Ceremony “Thank You” reception, prior to a weekly troop meeting at the Middle Island Fire Department. Mr. Bailey is tasked with the planning and coordination of the Calverton Flag Placement Ceremony, at which his troop members actively participate each year. 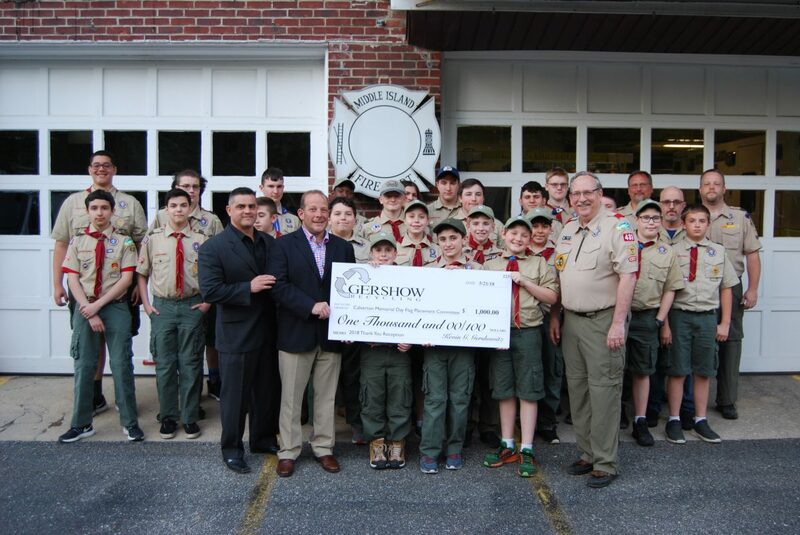 On May 21, Ray Colon and Jonathan Abrams, Managers, Gershow Recycling, presented a check for $1,000 in support of the Calverton Cemetery Flag Placement Committee, during Suffolk County Boy Scout Troop #433’s weekly meeting at the Middle Island Fire Department. Troop Leader, Frank Bailey is also the Chairman of the Flag Placement Committee. The 24th Annual Flag Placement Ceremony will take place on Saturday, May 26 at Calverton National Cemetery. The money will pay for the sponsorship of the “Thank You” reception, which recognizes local Boy Scout and Girl Scout troops, military groups, their families and other volunteers who place American flags in front of more than 210,000 grave sites. This event has a special meaning to Mr. Colon, whose father, Ramon Colon, Jr., served during World War II and was interred at Calverton in 1993.